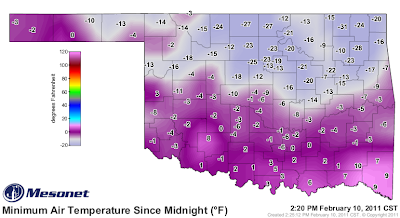 The Oklahoma Mesonet station at Nowata reached a low temperature of -31 degrees this morning. Pending verification procedures by NOAA's National Climatic Data Center, that mark will eclipse the previous statewide record low temperature of -27 degrees. The previous record was set at Vinita in February 1905 and at Watts in January 1930. Numerous other low-temperature records were broken this morning across the state, with several locations dropping below the previous statewide record. The National Weather Service site in Bartlesville recorded -28 degrees this morning, as did the Oklahoma Mesonet site at Pryor. 8th Highest Total Seasonal Snowfall - 19.6"
Last year's seasonal snowfall (5th Highest) - 23.2". 2nd Highest storm total snowfall - 12.1" on January 31 - February 1 (tied with January 5 - 7, 1988). The highest of 13.5" occurred on December 24, 2009. 2nd Highest 24-hour snowfall - 12.1" on January 31 - February 1. The highest of 13.5" occurred on December 24, 2009. 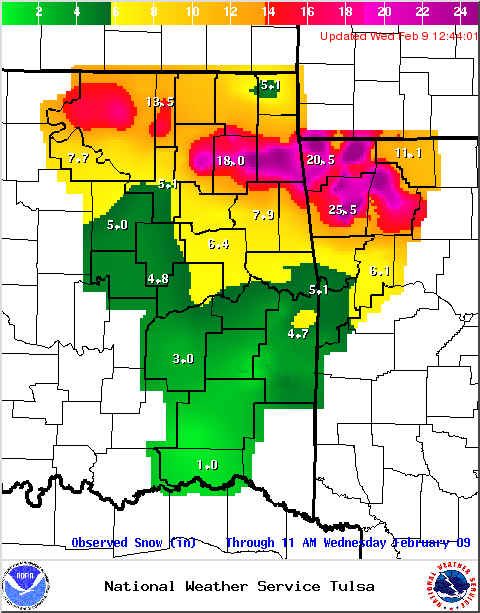 1 PM Update: The 5.7" of snow as of noon brings the monthly total for Tulsa to 22.5" and the seasonal total to 26.1". These are both all-time records. Snowfall map and list of observations have been updated; added map for western Oklahoma, including Oklahoma City area. 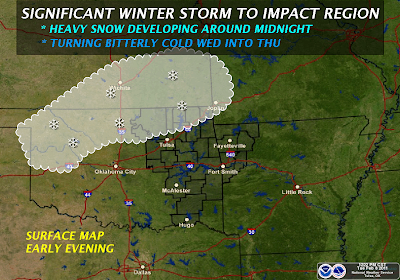 OKLAHOMA AND NORTHWEST AND WEST-CENTRAL ARKANSAS. TRAVEL HAS BECOME VIRTUALLY IMPOSSIBLE IN THE HEAVIEST SNOW AREAS. 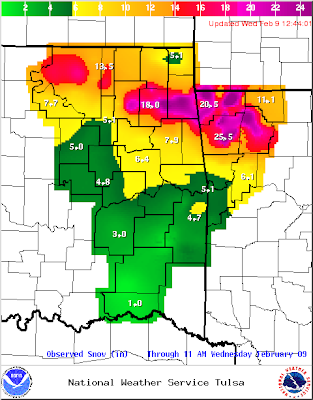 As of 9 am CST this morning, the National Weather Service is reporting a preliminary snowfall total of 5.1" at Tulsa. This would make the monthly total to date 21.9", which unofficially breaks the previous record of 19.7" in March 1924. The seasonal total of 25.5" is the second highest on record. 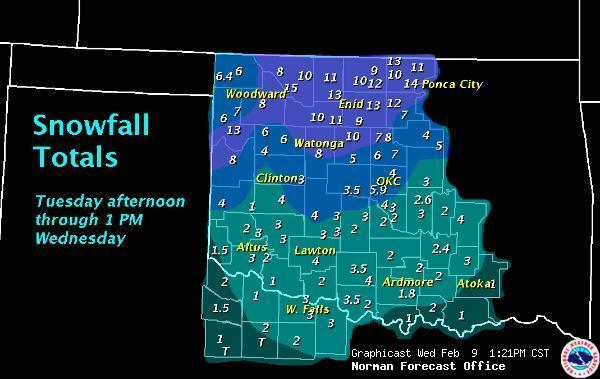 At 10 am, moderate snow is continuing at Tulsa. 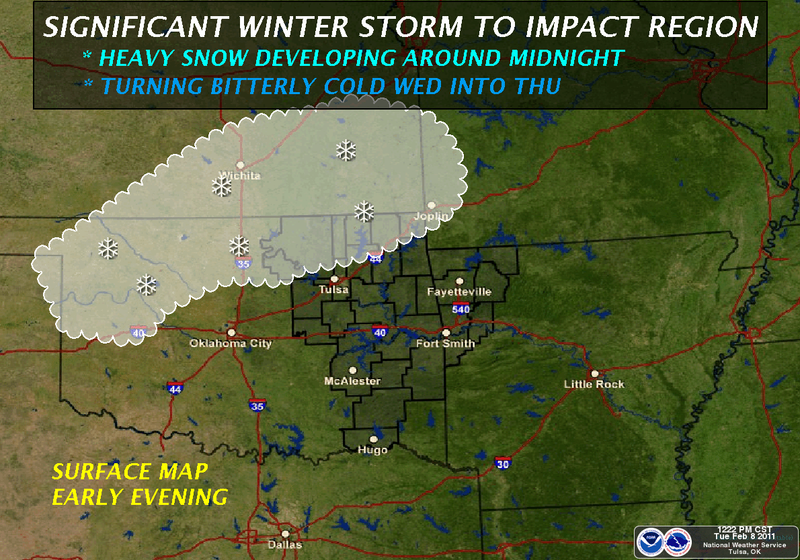 Light snow began at Tulsa shortly before 10 pm CST tonight. By midnight, visibility was down to 1.5 miles. Precipitation was only 0.02", but the depth of snow on the ground had increased by 1". Total new snow accumulation is forecast to be 6-9". Daily temperature records were obliterated across the San Francisco Bay area on Super Bowl Sunday, February 6. In all, 24 high temperature records were set within the San Francisco/Monterey region. In Oakland, the new records of 81° both downtown and at the airport blew away the old records by 13° and 10° respectively. The downtown temperature tied the all-time February record, and the airport reading broke the monthly record. Santa Rosa broke a 99-year record by an amazing 4°. Records were also tied or broken inland across the Sacramento Valley; Red Bluff broke a nearly century-old record by an incredible 6°. 72 WHICH WAS SET WAY BACK IN 1917. 73 LAST SET IN 1996.